There’s plenty happening in North County these days. Craft breweries, cool little restaurants, shopping destinations, and more are popping up all over the place. Next time you want to take a little drive to somewhere new? Check something off the list below of spots that opened in the second half of 2017. Authentic Hawaiian food comes to Del Mar by way of The Lanai with its ahi poke, Kalua pork, and spam fried rice. Also, read this with drool slopping outta your mouth: the loco moco features a beef patty, two fried eggs, onion gravy, and steamed rice. Located in downtown Del Mar – there’s also a Lanai permanent food truck in Leucadia – the sit-down Lanai serves fresh fish caught daily and is a nice casual addition to the Del Mar food scene. What? A craft brewery in Del Mar? They’re migrating! It’s true. Del Mar’s first brewery opened recently in a cool spot overlooking the San Dieguito Lagoon. The 7,000-sq.-ft. indoor/outdoor brewery serves a full gastropub menu and both house beers and unique selections from other breweries. As for ambiance, expect a warm, open space with fire pits, belly bars, swingset booths, communal seating, and a grass area with lawn games, including the very popular corn hole. And as you might expect with Del Mar, Viewpoint is indeed dog-friendly. A whole place devoted to grilled cheese? Heaven exists! First opened in La Jolla by the Greengo Grilled Cheese food truck people, Grater’s second gourmet grilled cheese brick and mortar establishment opened in early 2017 in the Del Mar Highlands Town Center. North County foodies will soon be able to inhale cheesy delights from the signature Basic 5 featuring a blend of five cheeses to a lobster grilled cheese made with butter-fried lobster and snow crab. This super successful artisan sandwich spot comes to Del Mar with its local food-based menu. Everything from vegan to gluten-free to kids’ meals are here and rumor has it, rank high on the amazing scale. Oh! There’s “artisan” salads, too! Now there’s an option to unhealthy drive-through cuisine, and it’s called Plant Power. The first location opened in Ocean Beach awhile back, and the concept finally made its way to the Cardiff area. Serving all plant-based foods, this healthy hot spot’s standout items include the Horchata Milkshake, Voodoo Fries (made with onions and “cheese”), and the Wake & Bacon black bean burger. The menu is varied enough to offer something for everyone, including kids, and even includes healthy dessert options. 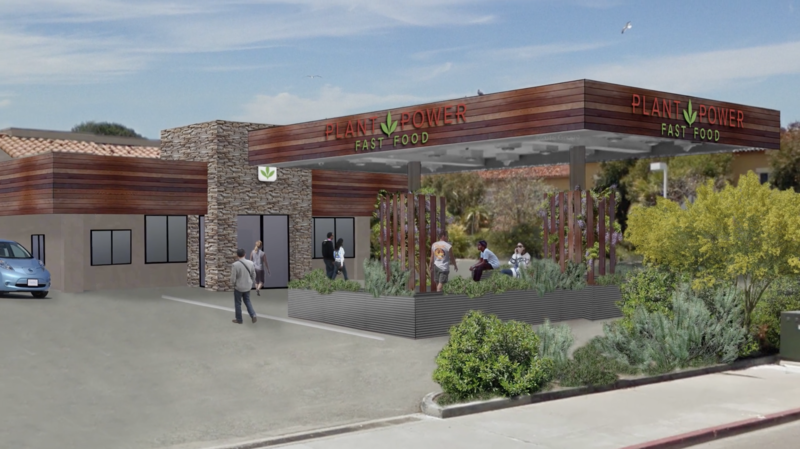 If you want to get some fresh air out of your car, Plant Power has a small outdoor seating area and walk-up, too. First opened in Little Italy in November 2015, the Crack Shack quickly grew to obsessed-fan status. The gourmet fried chicken eatery envisioned by the Juniper & Ivy founders features free range, organic Jidori chicken sandwiches and more. Expanding to Encinitas in spring 2017, Crack Shack opened in a former Coco’s restaurant and has a walk-up order window, open-air seating, a bar, bocce court, dog-friendly patio and a sandbox for the kids. Like its Little Italy location, Crack Shack continues its chicken theme in Encinitas and serve all-day chicken and egg options. In its brief tenure in San Diego, the spot has already earned a number of accolades, including being named by MSN as one of the best chicken restaurants in the U.S. This family-owned (father and son) brewery in Carlsbad operates – where else? – in an industrial complex as a Brewery Igniter location. Opened in the spring of 2017, Wiseguy serves snacks, sodas, and of course, a selection of IPAs, stouts, and more. Dog- and kid-friendly, Wiseguy also features board games and good vibes in its small, modern space. Want a beer suggestion while we’re at it? Try the Goofy Foot IPA. Another Brewery Igniter turnkey location opened in the spring, Rouleur sits right next to Wiseguy so you don’t have to get in your car to visit another brewery. Opened by engineer and cyclist (thus the Rouleur name), Rawley Macias, Rouleur’s beers are, according to the website, “inspired by the collaborative, artisanal craft of modern breweries and the secretive, monastic breweries of the Old World.” Sounds pretty intriguing, don’t it? Try the ales of all kinds in Rouleur’s tasting room designed as an homage to cycling. Widely known as one of the most beautiful breweries in the area decor-wise, Burgeon’s tree-themed, woodsy interior is only the backdrop for its impressive list of pales and IPAs. Grab a stool in the ample, ambient space off Palomar Airport Rd., and sip something spectacular. Also note that even though it’s been open a relatively short time, Burgeon already lays claim to San Diego International Beer Festival gold for its Taking the Biscuit bitter. Speaking of, Burgeon is dog-friendly. If you’re hungry, know there’s often food trucks parked outside or that Bressi Ranch’s Pizza Port and other restaurants are nearby. You’re surely familiar with the Dave & Buster’s off the 8 in Mission Valley – and now us North County residents have a location closer to home. Opened at the end of January, the popular sports bar/arcade/restaurant chain is located at the Shoppes at Carlsbad. Dave & Buster’s second San Diego site measures 40,000 square feet and is a hot spot for local families – not to mention a job magnet because the chain is currently hiring. The Shoppes at Carlsbad currently hosts a Regal Cinemas, dozens of retail stores, and a Macy’s. This popular craft-beer-and-American-food pub concept also hits The Shoppes at Carlsbad, but at the end of 2017. Currently, the closest location to North County is Mission Valley, so fans soon won’t have to Uber as far to enjoy its charms. Serving its signature fun from a 10,000-square-foot location next to Regal Cinemas, Yard House should be a perfect before- or after-movie dining destination. This multi-level neighborhood dining and drinking hub opened recently in Carlsbad Village and is 8,000 delicious square feet of plaza-style food and drink options. As its name suggests, Park 101 features a park-themed vibe with trees, benches, and greenery and a modern open-concept design. Park serves grab-and-go sandwiches, pub food, coffees, ice cream, and more. Eateries include the Garden Pub, Deli & Dough, Smoked Meats, and Tamarack, a rooftop lounge where visitors can enjoy beer and wine. Many spaces within Park 101 are also kid- and dog-friendly. South Park’s Piacere Mio made its way to North County in the spring with a second location. Like its more southern counterpart, Piacere serves up authentic Italian food in a modern rustic spot in the Del Sur/4S Ranch area. Reviewers rave about the food, especially the housemade gnocchi and lasagna. The menu also offers a nice selection of pizzas fired in a wood oven manned by fourth-generation Naples pizza maker Augusto Folliero. If you’re in the mood to create your own food masterpiece, order from the “design-your-pasta” part of the menu, and select your pasta – there’s usually a gluten-free option on offer – and one of nine sauces ranging from your classic tomato to pink sauce with shrimp. Speaking of popular restaurants making their way to our neck of the woods, North Park’s Waypoint Public now has a location in North County at the Del Sur Town Center. Serving pub food like wings, salads, burgers, and more, Waypoint’s big sell is the kids’ area, which keeps your beloveds contained and playing nearby while you try to eat in peace. Waypoint’s craft cocktail, beer, and wine menu also draw the locals, and brunch turns out to be quite the magnet, too. Japanese noodle house and barbecue, Wokou, opened in Carmel Valley within The Village at Pacific Highlands Ranch in spring 2017. The 3,000-square-foot restaurant serves ramen noodle soups, yakitori, and Japanese-inspired tapas, plus a big selection of craft beers and cocktails focused on Japanese whiskey. Concepted by Social Syndicate, the imagineers behind The Local, The Rabbit Hole, and Ocean Beach’s new OB Surf Lodge, Wokou is reminiscent of urban noodle houses and sake bars. Also joining the wildly expanding space at The Village at Pacific Highlands Ranch, Breakfast Republic will open sometime in 2017. Breakfast Republic already has locations in North Park, Liberty Station and Encinitas, and is known for cooking up unique twists on classic breakfasts. Look for cool entree options like Breakfast Bacon Mac ’n Cheese, Vietnamese Chicken Wing Breakfast Bowl, and Mashed Potato Omelettes. If you’re not in the mood for coffee, enjoy a beer on tap, offered as accompaniments to the savory and funky dishes Breakfast Republic concocts. Estimated to come in at 3,100 square feet with a patio and mezzanine level, Breakfast Republic’s newest location should accommodate the influx of new fans sure to come its way in April. Know the 2Good2B in Encinitas? Now there’s one in Rancho Bernardo for the inlanders! Specializing in gluten-, corn-, and soy-free breakfast, lunch and early dinner. 2Good2B serves omelettes, pizzas, paninis, salads, soups, and all kinds of bakery goodness made the healthy way. Try one of 2Good’s baked pot pies with taro chips on the side and you’ll never want traditional crust or potato chips again (we might be overstating things a bit), but that’s how good 2Good is – trust us! This popular restaurant concept especially popular in Rancho Bernardo came to San Marcos in March and is not only a restaurant, but multiple bars, a brewery/barrel room, AND an eight-lane bowling alley. All the fun happens in a 21,000-square-foot open concept space, which also includes – if you can even handle it – a big patio, beer garden, bocce courts, table games and fire pits. With its mead hall styled after the authentic Norwegian version, and its tasty selection of meads and ciders, Twisted Horn’s taken the Vista craft brewing scene by storm. Try something new to you like the Wizcraten Elder mead with honey, elderflower, and lemon, or the Mischief Maker, an unfiltered cider. Twisted Horn uses all natural ingredients in its mead and cider making, and sources varietal honeys from local bees boasting magical-sounding flavors including star thistle and mountain sage. Sip a few in the cool tasting room and grab a bite from the food trucks that stop by regularly. Celebrating its soft opening in July, Ebullition is new to the Vista beer scene. Nice-sized with plenty of seating, and family friendly with board games (think giant Connect 4) and TVs, Ebullition has eight beers on tap including a Saison, IPA, stout, and more. Tasters love the bottoms-up beer filling system for perfectly poured pints. This new Vista entertainment destination for kids and adults features several activities to keep everyone busy and happy. Options include miniature golf, bumper cars, rock climbing, a rope course, a dance room, arcade games, Bazooka Ball (a “softer” variation of paintball), and more. There’s even an American Ninja Warrior obstacle course designed by the man who does the courses for the show. Oh, and most things glow – think neon lighting everywhere. (*Just outside North County) This huge distillery, restaurant, and bar sits on 50,000 square feet in Miramar’s industrial area. Once part of the Ballast Point family, Cutwater is now its own super cool thing. Visit for a chill craft cocktail on the patio warmed by the flames of a sleek fire pit, or take a seat inside at the bar or in a lounge area. A modern but earthy vibe awaits you and so do creative cocktails – including the popular and curiously-inducing canned cocktails – and a nice selection of upscale bar food like small plates, salads, and burgers.